The chat was amazing. Many preservice teachers from #UNILitEd in Cedar Falls, Iowa, were participating in their first Twitter chat. We hope they will continue to participate in chats, grow professionally, and find additional sources of on-line learning. I quoted Donalyn Miller’s research in the chat. (link) Also Nell Duke’s Edutopia article here. Another new source during the chat was “Sustained Silent Reading: What the Research Really Says“. Accountability for Independent Reading. Students can choose many non-invasive ways to keep track of their reading. 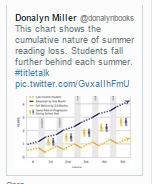 I can’t say enough about how I love the “book stack” showing a month of reading here in Christina’s tweet via learning from Penny Kittle. And after all, what are a student’s rights? What will you do to ensure quality implementation of Independent Reading? It’s my Kindle on my iPad. It’s lit. Have I ever NOT been reading? I remember reading BEFORE I went to school for kindergarten. I remember lying in front of a south window trying to sneak in a few more minutes of twilight reading hours. In later years I remember having a flashlight and a book under my pillow in the camper so I could read if I wasn’t sleeping. And now, now I read from my iPad. Sometimes I read just a page or two. Sometimes I flip back to an old boring friend and read just a page or two. And sometimes I read until the book ends! Kylene Beers and Donalyn Miller (#TCRWP Reading Institute) have told us that series readers will be life-long readers. Encourage students to embark on the exploration of a series OR TWO during the summer and they will be on the way to slowing or even stopping the “summer slide”! I’m not in favor of “mandated lists” because I believe that student choice builds a love of reading. Here’s some advice . . . These eight bullets can help you, the teacher, increase your own voraciousness as well as that of your students! Of course, building in a bit of humor as in “How would I rewrite the titles to fit a different concept?” can produce a graphic like “Hungry for Books”! What does your reading list look like? How many TBR stacks do you have? How did YOU become a voracious reader? And what does this look like in a high school reading workshop???? How would you know if you have voracious readers? Fabulous ideas from students incorporated into this rubric. Do what it takes to BUILD a community of Readers! Spending more time studying shared reading is definitely NOW on my “To Do” list for this summer as we heard (and experienced) the benefits of shared reading where the teacher has a large text (big book, chart, smart board, doc camera) that the teacher and students read chorally. The three basic purposes that we explored for shared reading were: introduce a new text, reread a text, or as a warm-up text. 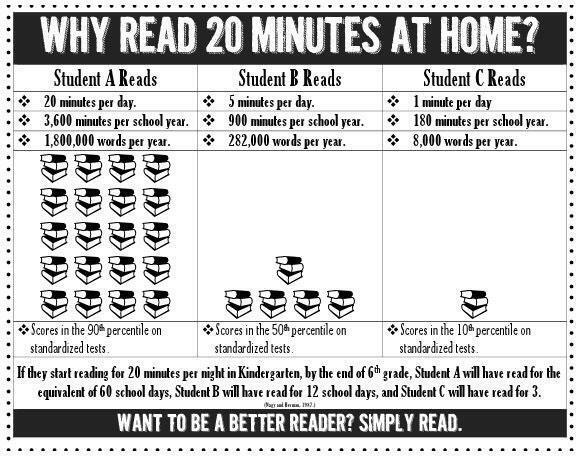 As with many reading components, the amount of time spent on shared reading can vary as long as students are ENGAGED! And to learn that the time could be just five minutes here or there makes the plan to include shared reading so much easier! The benefits for students are many. The most obvious is that accuracy, fluency, and comprehension all improve with rereading so beginning approximations are celebrated. Students are rereading with their friends so they have built in support from the teacher and fellow students. And shared reading helps build that sense of a community of readers in the classroom. One book we used was Brown Bear, Brown Bear. This shared reading could end with writing our own book. ______, _____ what do you see? I see ______ looking at me. If student names are on post its and the class practices reading this with their own names, they are also beginning to get in the repetitions needed for some sight words. Will some be memorizing? Of course! It’s so important that auditory memory gets involved, but the teacher can, by pointing to the words, have students match her pacing! Shared reading is a valuable use of readers’ time when students are reading! Interactions can include gestures and movements during shared reading. Text variety is important: listening centers, You tube video with text or Raz kids. You don’t have to wait until you have little copies of the text! Shared reading is a safe way for students to “join in” reading. Not everyone’s voice will be heard the first time but the goal is to encourage student voices to become the voice heard in shared reading. Shared reading is fun, exciting, and joyful. What a great way to sneak in a bit of content/holiday/fun that just doesn’t fit elsewhere! Two teaching methods that we worked with today were inquiry (fluency demo) and reminder – definitely coaching light! We have to continue to know how to help students meet their goals and build the habits of readers. Again this requires deep content knowledge. Organize your small group materials. Have extra copies of all tools out for students with a student as “Tool Monitor”. Study the progressions with colleagues. Develop the “cheat sheets” – four levels on a page to be cut apart. Reading notebooks have the evidence of work towards student goals. That can be an index in the back. Make sure that a student does the work during small group time. They have to be practicing and doing the work for it to transfer. And group time does mean LESS reading time! Kate began with a bit of background about close reading. What it is. What it isn’t. How long we have been close reading – “since the monks were in caves with candle lights flickering trying to determine the meaning of the divine”. If you need background on Falling In Love with Close Reading, do go to Kate or Chris’s blog here. It’s so NOT boring to do some close reading with Kate. Step 1. Listen to the song twice. What would my kids say the message or meaning is? Listen again and make a vertical list of all the words or phrases in the song that speak to you and go with your current message. Step 2. Sync up your list with a partner and look for patterns. What words or phrases are the same? Use this list of evidence to find patterns (This is the HARD work of close reading.) Which words or phrases go together? Color code! Step 3. Think some more – what is the message in this song? Step 4. Transfer to written text. Practice with nonfiction text. We do “close read” the things we love – pay attention and even “hyper attention” to those things we love. Let’s build upon that awareness/attention/attraction. Close reading should be fun and joyful. Close reading with a song or poem is a wonderful entry point. It can’t be drudgery! Close reading is about beginning with the text for evidence. Don’t leap to interpretation or “guessing” what someone / test writer wants! An act of close reading is taking the rough draft idea to a more interesting idea for you! This slide sums up much of what Donalyn Miller said to us. I have so many responses to Donalyn’s presentation: as a teacher, coach, mother, grandmother, and most of all, as a reader. What harm is being done to students in the name of inappropriate actions, beliefs and practices? Well-intentioned? Yes. Mis-guided? Yes. To support you, go to Donalyn’s most popular posts. or to hear about books – The Nerdy Book Club! To be better readers, kids need to read every day. Provide access to books that kids CAN and WANT to read. Books need to be mirror, windows, and doors to lead readers to connections. How are you building communities of readers? What actions support your beliefs? What is your plan to build even stronger communities that love to read and choose to read? How important is a reading life? A recent post To Be a Reader included quotes from Donalyn Miller’s “Getting on the Bus“. Lanny Ball wrote about supporting middle school readers in “Be a Reader Yourself: Lessons from the Branding World“. 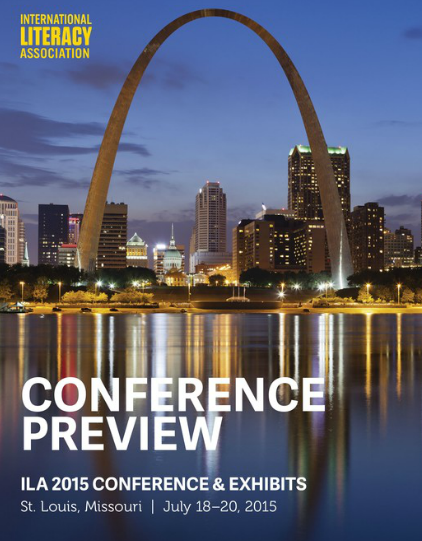 And then I saw this from Regie Routman, “What I’m Reading, February 2016“. As a reader, I have many choices. I can share my reading notebook with lists of books read. I can blog about favorites. I can talk endlessly about the books I’m reading, the ones I have just read or the ones that linger on my most favorite list. I can participate in the Title Talk Twitter chat on the last Sunday of each month. I can peruse the many entries from The Nerdy Book Club. There’s even an “It’s Monday, What are You Reading?” group. How are you sharing your readerly life? 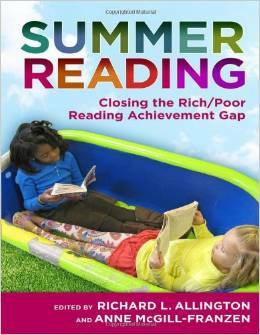 #SOL15: Summer Reading – How important is it? Do you have a stack of books to be read? A reading group that will meet? Regular trips to the library? Why do you read in the summer? I’m currently revisiting multiple books and chapters on “mentor texts”. I’m not reading straight through. I’m looking for specific details to flag and reread AGAIN at a later date. Reading for fun is off the list as the school year winds down and I prep for summer classes. My reading doesn’t stop. But I find that my reading shifts and there is a surge in my “Reading to Locate Information” habit that overpowers my “Reading for Fun” habit. What do your reading habits look like? Do they change in the summer time? Do you make time for leisurely reading? How do we explain our “habits” to our students? Does all reading have to be “serious reading”? Why should students read at home? I’m sure that many of you are familiar with this graphic. But what about this one that Donalyn Miller posted on Twitter this week? The title of the graph is “Low Income Students Fall 2.5 to 3 Years Behind by Grade 5”. The yellow line shows the cumulative growth of low income students vs. the blue line for middle class students. Similar data can be found in this John Hopkins article, “Why Summer Learning Deserves a Front-Row Seat in the Education Reform Era”. Richard Allington says that 80% of the summer reading loss is tied to income. That’s an astonishing fact that does seem to be supported by the graph above. His data from sending 10 books home for students in Florida emphasizes the importance of students reading ALL.YEAR.LONG! For more ideas about summer reading programs check out his book. Additional resources from Richard Allington can be found on his website here. How can we encourage reading ALL.Year.Long? How do students become habitual readers? 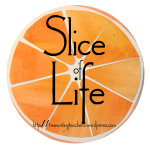 Slice of Life 23: How much reading is enough? I LOVE to read. I LOVE reading. I typically READ just about anything. Reading is my preferred activity over cooking, cleaning, or crafting. I could be considered a voracious reader by some. I read quickly when I am reading for fun. I will read almost anything but I do not like vampires, fantasy or science fiction very much. When I find an author that I like, I devour ALL their texts. When I find something I really like, I may reread it. There are times during the year when my reading life seems to suffer. While writing blog posts every day, I do have less reading time. Is it “okay” that my reading seems to have an ebb and flow? How much should I be reading? What should I be reading? I believe that I need to be familiar with authors and texts in the field of literacy. I have my favorite authors and this year they all deal with loving literacy: Chris Lehman and Kate Roberts, Donalyn Miller, Penny Kittle, Kylene Beers, Dorothy Barnhouse and Vickie Vinton, Jim Burke, Kelly Gallagher, and all the authors of the fabulous Units of Study in Writing from Teachers College. My reading of YA varies according to the favorites of students in the buildings where I work. How does reading play out for our students? How much should they be reading? In Book Whisperer, Donalyn Miller challenges her middle school students to read 40 books per year. That is basically one book per week, including reading over holidays and school breaks. A student who has developed those “reading habits” is likely to be successful as they move through life. In Reading in the Wild, Donalyn is more specific about the “habits” that students need in order to be life-long readers. Those numbers seem to make sense because a student will “be in the story” and stay connected to the text in those time frames. For our struggling Middle School and High School students in Second Chance for Reading, I have suggested teachers set 30 books per year as the goal for students. If teachers have expectations and are carefully monitoring student work, 30 books is ambitious for students who have been less than successful in reading for years. It’s doable, a stretch but yet highly possible if the habit of reading becomes a part of a daily routine. But is that “good enough” for our children? How long to read a book? I was following the Twitter stream from the Saturday reunion at Columbia’s Teachers College and several tweets caught my eye. Exactly what books should students be reading and for how long? So taking Hatchet and spending a week and a half on it would fit with Donalyn Miller’s goal of 40 books per year. Is this happening? Are students allowed to read a book like Hatchet in a week and a half? I believe this also fits with the belief behind CCSS Reading Anchor #10: “Read and comprehend complex literary and informational texts independently and proficiently. Yet, it seems like I should be doing more in order to have teachers and students consider the “sheer volume” of what they are reading. Are there books that should be “whole class” books in grades 3-6? If yes, what would be the characteristics of such a book? And how “many” of these would a child read during any given year? I remember working on Language arts curriculum 20 years ago when teachers wanted certain books to be on a “protected list” so teachers in grade 3 would not use a book reserved for grade 4 because then it could not be used for prediction. But what is the real goal of a “class book”? If it truly is to have all students explore specific texts, will the class read at the same pace? Is it about the “activities” that accompany the book and its reading? What about a book club approach? So Kelly would agree with Donalyn Miller that students should not be spending forever on a class book. Dragging a novel out into 9 weeks’ worth of work turns it into a “9 week worksheet”! That belief has also been espoused by Richard Allington who has said that students need to read “more” in order to be better readers! Are there some books that every fourth grade student should read? That would be a great source of conversation for a team of fourth grade teachers. What literature is that important and that interesting for the students? The same question would apply for informational text, poetry and drama. Those decisions can and should be made at a local level. The caution would be in “not allowing” a whole class text to be the only reading at the time and also not to be drug out as Gallagher’s quote reminds us. How much should a student read every day? The original source of this quote is not listed but think about this for a minute. To stay on the same level (maintenance), a student needs to read just right books for an hour each day and a common expectation in about 3/4 of a page per minute. So a quick check by a teacher 5 minutes into a silent sustained reading time would suggest that all students had read at least 3 pages. If a reading log/goal setting page includes the page started, a teacher could quickly move about the room conducting a visual scan. This would be data that could allow the teacher to form groups to discuss goals and purposes for reading. The goal would not be public humiliation. I have used “bribes” for reading – pizzas, food, parties, etc. in order to encourage students to read more. Sometimes the food begins as the “reason/purpose” for reading until a student becomes “hooked” on reading and then begins to ask for books for gifts! Students do not need to take quizes to show their understanding of books. Carefully remove barriers or practices that are “counter-productive” to reading MORE! Consider how you can help your students be daily readers who will carry that habit over into the summer even when you, the teacher, are not around! How much are your students reading? How do you encourage them to set HIGH expectations for their own reading?